Why on earth is College Gameday going to Times Square next week? Here at The Loop, our love for College Gameday is well-documented. There isn't a better, and more fun, pregame show in all of sports. Waking up at 9 AM on a Saturday may seem like a foreign concept to some, but for college football fans, it's a fall tradition. When Gameday comes "TO YO CITAAYYYY", it's a cherished occasion. It means your school has earned the right to be the center of the college football universe, even if just for a few hours. Unless you're Ohio State, where apparently ESPN has to fill some sort of quota each season of appearances in Columbus. Spoiled brats. That's why when I came across this tweet from the official College Gameday account, I was shocked, and frankly, appalled. That's right. Gameday is heading to Times Square next week. The tourist capital of the world. New York City. Where college football tradition goes to die. If you had to come up with the least deserving place on planet earth for Gameday to make an appearance, Times freakin' Square would undoubtedly be first on everyone's list. There isn't even some random neutral site game at MetLife Stadium that ESPN can use as an excuse to travel to that urine-stenched hell on earth. It makes no sense. In recent history, Gameday has made a point of traveling to new, unique places, like North Dakota, Western Michigan, and the Harvard vs. Yale game. All were well-received, well-attended, and well-earned. It's understandable they want to continue to branch out to new venues, but it's a slap in the face for Times Square to be one of them. If you've ever watched a sold out night game in Boulder, you know there's only one word to describe it - LIT. The Buffs were one of the pleasant surprises a season ago, making it to the PAC-12 championship after being picked to finish last in the conference in the preseason. Barring two huge upsets, Colorado and No. 6 Washington will both move to 3-0 this weekend, and the Huskies travel to Folsom next week. Gameday hasn't gone to Boulder since 1996! It would be an unbelievable, and LOUD atmosphere. But at least the constant, ear-ringing sounds of ambulance sirens and car horns will make it loud at gameday. Gameday has made the trip to Stillwater five times, and as recently as 2015, when Rickie Fowler appeared as the guest picker. Next week, Oklahoma State takes on TCU in what will almost certainly be a ranked vs. ranked matchup, with OK State sitting at 9th and TCU at 20th at the moment. Passing up on another chance for Lee Corso to fire off a few pistols is an egregious error on ESPN's part. Kinnick Stadium is one of the more underrated atmospheres and stadiums in all of college football, no matter what the Hawkeyes record is. Despite a very solid run of success since Kirk Ferentz took over as head coach in 1999, gameday has gone to Iowa City just twice, and hasn't returned since 2006. Penn State, the No. 5 team in the country, will come in next week at 3-0, as will Iowa. The game is already locked in for primetime on ABC, and the home crowd will be out for blood. Not sure what the crowd in Times Square will be out for other than clogging up the sidewalks and pointing up in amazement at all the tall buildings. Much of this would hinge on Cal beating Ole Miss this weekend, which seems unlikely with the way the Rebels are playing. But the Golden Bears did just beat North Carolina as a 12-point underdog on the road two weeks ago, so don't be shocked if they test Ole Miss. Then it's on to in-state rival and No. 4 USC next week. Gameday has never been to Cal-Berkeley, but they've also never been to Madam Tussauds... so there's that. If they want to knock off a quirky venue early in the season, the Dartmouth-Holy Cross game wouldn't have been a bad choice. 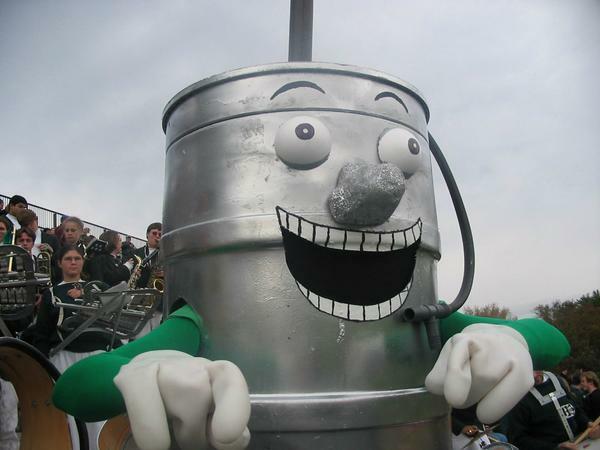 It's the home opener for the Big Green, and could have provided an opportunity for Corso to do a keg stand with Keggy the Keg. Talk about a missed opportunity.